Join us for a provocative journey through space and time. From sea level to the high alpine, witness the dramatic diversity of our island’s landscape including Mauna Kea Summit and stargazing. The Stargazing component of our adventure depends on natural conditions. Although more than 90% of our trips have fine stargazing conditions; MKSA does not guarantee the weather in any way. Afternoon trips depart daily from Hawaii Forest and Trail Headquarters, Waikoloa Queen’s Marketplace, and the Junction of Waikoloa Road and Highway 190. 7 – 8 hours round trip. Easy to Moderate; ages 16 and over. Picnic style dinner, assorted teas, hot chocolate, and dessert. Dinner selections are either Barbecue Chicken (served hot) with Lemon-Mint Quinoa and a Dinner Roll; or a Vegetarian Tofu Wrap (served cold) with Peanut Dipping Sauce, Lemon-Mint Quinoa and a Dinner Roll. Hot Chocolate and Brownies served for dessert. Hooded parkas and warm gloves. Tour limited to a maximum of 14 guests. Guests should be able to hike on uneven or rocky terrain. We sometimes encounter cool, wet or muddy conditions. Because of high altitude this tour is not advised for those with respiratory, circulatory or heart conditions, pregnancy or poor health. Scuba divers should be aware of altitude dangers. No children under 16. Other tour restrictions may apply. Closed toe shoes, long pants and a sweatshirt or sweater. The drive to the summit of Mauna Kea is one you’ll never forget. It’s hard to believe you’re in Hawaii as you climb to 13,796 feet above sea level. 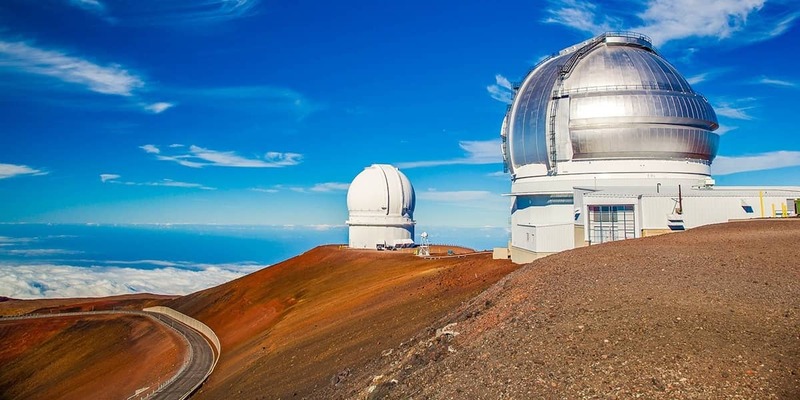 Once at the summit we are afforded spectacular views of the horizon, Haleakala on Maui, Mauna Loa and Hualalai, and Mauna Kea’s world-class array of telescopes. Mauna Kea is the world’s tallest mountain, rising over 32,000 feet from the ocean floor to its summit, which is considered by many Hawaiians to be the most sacred place in all the islands. In your hooded parka you’ll stand in awe at both nature’s sublime creation and man’s astonishing technological achievements. Starting out from our headquarters in Kona, we travel up the coast over desolate lava flows for about a half hour before proceeding up the rolling pasturelands on the flanks of Mauna Kea. Turning onto the Saddle Road that traverses the island between Mauna Loa and Mauna Kea, you’ll see a dramatic and diverse landscape of ranchland, sub-alpine dryforest and rainforest (with striking features such as cinder cones, lava flows, lava tubes and kipuka). We arrive at our private dinner location at Humuula approximately 2 hours before sunset for a hot, picnic dinner served family style. After dinner and with a winter-style parka in hand, we’ll make the 45 minute drive to the summit. As your make your way up, you’ll be fascinated by your Interpretive Guide’s interpretation of Hawaii’s remarkable natural, cultural, and geologic history. After sunset we descend to the Visitor’s Information Station at 9,000 foot elevation. Here we set up our own telescope and have a star gazing party. Wrapped warm in Arctic parkas, enjoying hot beverages and cookies, you will marvel at the brilliance of the Hawaiian night sky. Your Interpretive Guide will share with you stories of the observable universe, and offer you a personal and educational look at the heavens. After a hot, picnic-style dinner we make our way to the summit of Hawaii’s most sacred mountain, Mauna Kea, for a sensational sunset amidst the most extensive collection of telescopes on earth. As daylight fades we descend to a lower elevation where your Interpretive Guide will reveal the wonders of our Hawaiian night skies. Are guests allowed to go into the observatories? Some observatories are open to the public daily until 4 PM. As our tour arrives after this time, the observatories are closed to visitors. How cold is it at the summit of Mauna Kea? Average mean temperature is freezing. Is the vehicle ride bumpy and windy? The access road to the summit of Mauna Kea is four-wheel drive only, so it can be bumpy. Our custom off-road motor coaches will get you to the top and back in safety and comfort. What kind of telescope is used for star gazing? We utilize an 11” Celestron Schmidt-Cassegrain telescope. What is the guide to guest ratio? Our maximum guide to guest ratio is 1:14. How many guests do take up per night? Our permit allows for a maximum of 2 vehicles per night and our vans carry a maximum of 14 passengers. Do we go up to Mauna Kea summit every night? We go every night, weather permitting. Children under 16 are not permitted on this tour due to altitude. Is there much walking / hiking on this tour? There is minimal walking on this tour, the maximum being about 150 yards. I would like to see a specific astronomical event from the summit. How can I arrange this? Check out www.space.com/nightsky for upcoming astronomical events, and whether they will be observable in the Hawaiian sky. Will there be snow on our trip? Snow is seasonal at Mauna Kea, with the heaviest snowfall occurring during the winter months. What if it’s cloudy on Mauna Kea? The summit of Mauna Kea is normally above the clouds. If the weather (clouds, snow, ice or high winds) cause us to cancel the tour, there is no charge, of course.